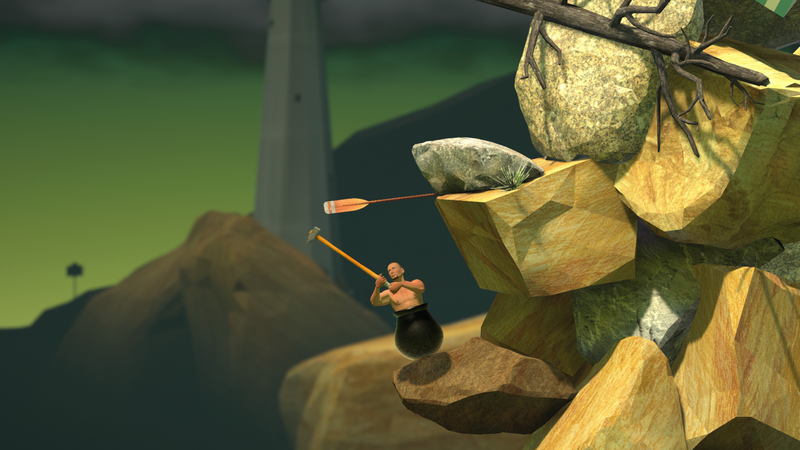 In Getting Over It with Bennett Foddy, a man in a pot tries to climb a mountain with a sledgehammer. A Chinese speedrunner named Ccfst recently seemed to help that man climb the mountain faster than anyone before him, setting a new world record that struck some as impossible. The skeptics were right. Over the weekend, Ccfst admitted he had cheated. On March 17, Ccfst said “I will not send a false record of goi again,” according to a screenshot of a now-deleted comment on Chinese social media provided by Keronari, the chief moderator of the Getting Over It speedrunning records page. Ccfst has since deleted his Getting Over It videos hosted on the site and the moderators of the speedrunning page have removed his world record and banned him from submitting records for six months. According to a Google translation of post currently at the top of Ccfst’s Bilbili page, he plans to continue speedrunning the game and eventually earn a legit record. Ccfst did not immediately respond to a request for comment. At the beginning of the year, the fastest anyone had completed Getting Over It was in one minute, 19 seconds. That record was set by Norwegian speedrunner Rengj. Then on January 31, Ccfst upended everything with a video purporting to show him completing the game in 1:13. Most of the game’s records are separated by fractions of a second. Coming in several seconds ahead of the previous mark is practically unheard of. “When he posted his 1:13 time it was pretty hard for us all to believe, because it was honestly an insane run but the run itself looked completely legit,” Keronari told Kotaku in a Facebook message. He’s not just a Getting Over It mod but a speedrunner. “It wasn’t spliced so there were no frame cuts to spot. Getting good at Getting Over It requires no end of patience and hardwork, as any little mistake can sned the player tumbling back down the mountain. Getting good enough to speedrun it requires grinding through those challenges until playing the game becomes like muscle memory, and even then it’s an uphill battle. Ccfst’s run looked too easy to many, and indeed it was. In a recent Reddit post on the subject, some in the Getting Over It speedrunning community said they’d suspected Ccfst of cheating from the start, but Keronari told Kotaku that it’s still not 100 percent clear what his method was. “With all of his videos deleted it’s hard to say when exactly it was that he started to cheat, and it was even hard to spot that he was cheating,” he said. Still, there are theories. “We believe he had used cheat engine to slow the game down (this also slows down the in-game timer) which would help make his movements easier, [give him] more time to react to everything,” he said. The theory is that a cheater using this method could then speed up the video to make it look like a normal run. In the days shortly after the record’s removal, a speedrunner called Stillow managed to set a new world record at 1:17. “There’s a bit of motivation now for some of the top runners to try grind that top spot again,” said Keronari. He said he’s content to let Ccfst learn from his mistake and doesn’t want to ban him from the community forever. But when he does return, Keronari plans to review his footage more closely. “We don’t want to go into all the details about these methods but one is that we would require a submission from the same player that has the in-game sound turned on—slowing the game down then speeding the video up would require the speed of the sound to also increase,” he said.